Wayne’s Paramour restaurant is hosting a seven-course, mid-winter beer dinner on Thursday, January 24th, 2012 starting at 6:30 p.m.
Main Line beer geeks-rejoice! 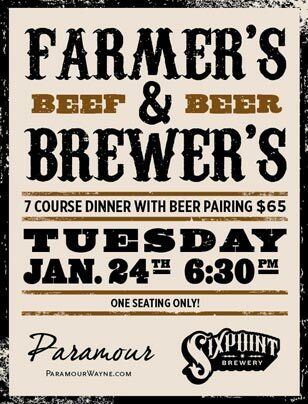 Join Paramour, Why Not Farm and Sixpoint Craft Ales for a truly unique Farmer’s & Brewer’s Mid-Winter Beer Dinner on Tuesday, January 24th starting at 6:30 p.m.
Paramour Executive Chef Michael Giampa will prepare a carefully planned seven-course dinner featuring all-natural and locally grown Scottish Highland beef from Why Not Farm in Glenmoore with specially selected beer pairings from Sixpoint Craft Ales of Brooklyn. You will also have the opportunity to speak with Chef Michael, the farmer and the brewer during the meal about the beef and the brew. $65 per person with beer pairing included. 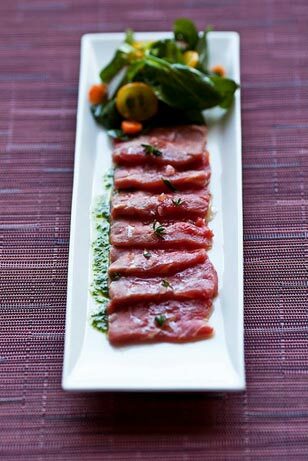 Call Paramour to reserve your table today: 610-977-0600. Paramour Executive Chef Michael Giampa will prepare a carefully planned seven-course dinner for the exciting January 24th beer dinner! Medium bodied, with a beautiful copper color, biscuity nose and notes of grapefruit, grilled nectarine and citrusy amarillo hops. 6.4% abv. Paramour is located at 139 East Lancaster Avenue in the Wayne Hotel in downtown Wayne, PA. To make reservations on OpenTable click here or call 610-977-0600. For additional events and specials, visit their website: paramourwayne.com.